to raise public awareness. Their nightlife peers changed the face of the UK club scene which created dozens of new bands, artists and designers. Born with the mutant party-animal gene, Graham Smith & Chris Sullivan are taking over Robert Pereno’s new Society Club in Soho for two reasons: to show off Graham’s stylish clubland photos, which will be selling there until Christmas; but chiefly to win over buyers who are dithering over investing £30 in their huge coffee-table book that is garnished with tall stories from Sullivan as well as 100 other club-world collaborators. Come along next Friday to meet them over a drink and to hear the garrulous Welshman Sullivan “in conversation with eminent journalist Michael Holden” — in other words, talking hind legs off donkeys. Orders for the book can be placed only online at Unbound Publishing (where Graham has an explanatory video) so they won’t be prising your wallet open on the spot. Inevitably, a further high point of the evening will be a free-entry after-party where Sullivan will be deejaying classic club tunes from 1976-84 half a mile away at The Aviary Bar. As of today there are only 16 days left to buy your prestige limited first-edition of We Can Be Heroes (there won’t be a second edition unless they reach 100% on the first) and you get your name printed in it. You’ll be within the same hard covers as starry contributors such as Robert Elms, Boy George, Gary Kemp and Steve Strange. The clock is ticking because of the new “crowd-sourcing” technique to raise funds. This is being pioneered in books by Unbound, a new offshoot of Faber, whose authors include Python Terry Jones, cultural taste-maker Jonathan Meades, and creator of TV’s This Life series, Amy Jenkins. 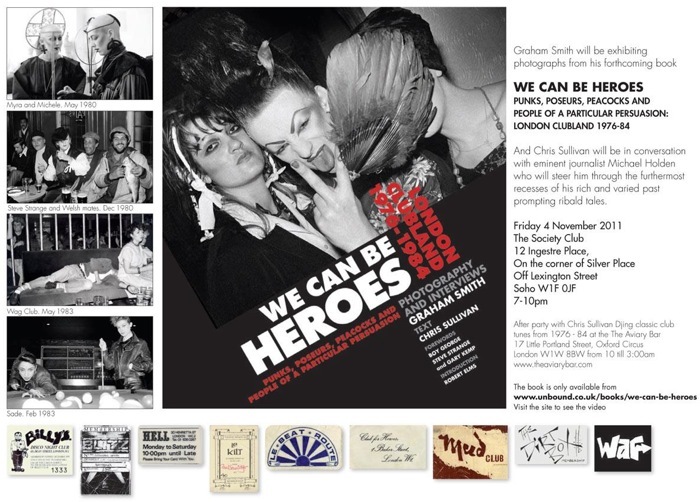 This entry was posted in Clubbing, Fashion, London, Media, Pop music, Youth culture and tagged 2011, Blitz Kids, Books, Chris Sullivan, exhibitions, Graham Smith, New Romantics, photography, Robert Pereno, Society Club, Soho, Unbound publishing, Wag club, We Can Be Heroes. Bookmark the permalink.